David Allwine was born in 1948 in Phoenix, Arizona. He enlisted in the U.S. Army on March 16, 1966, and after completing basic training at Fort Bliss, Texas, and advanced infantry training at Fort Ord, California, he served as an infantryman and indirect fire crewman with Company B, 4th Battalion, 12th Infantry Regiment of the 199th Infantry Brigade at Fort Benning, Georgia, from August to November 1966. Sgt Allwine then deployed to South Vietnam with this unit from November 1966 to June 1967, followed by service with the 576th Ordnance Company in South Vietnam from June to November 1967. His next assignment was with the 3rd Battalion of the 35th Armor Regiment in West Germany from November 1967 to November 1970, and then as an advisor with U.S. Military Assistance Command Vietnam from November 1970 until he was captured and taken as a Prisoner of War in South Vietnam on March 4, 1971. 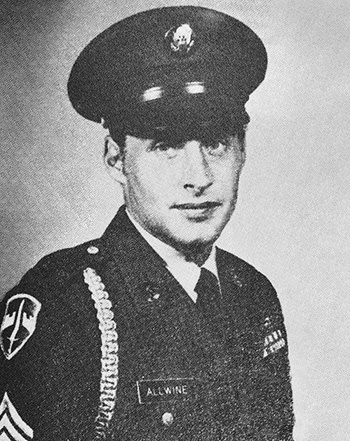 After spending 755 days in captivity, SSG Allwine was released during Operation Homecoming on March 27, 1973. He was briefly hospitalized to recover from his injuries, and then attended Warrant Officer Candidate school from March 1974 until leaving the program in May 1975. He then completed UH-1 Helicopter Repairman training before serving as a UH-1 repairman and helicopter technical inspector at Fort Carson, Colorado, from September 1975 to February 1978, followed by service as an aircraft quality control supervisor with B Company, 205th Transportation Battalion, in West Germany from April 1978 to February 1979. 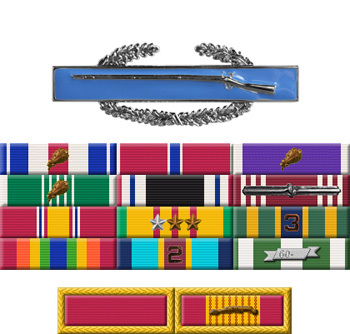 His next assignment was as a UH-1 repairman, platoon sergeant, and aircraft quality control supervisor with the 7th Aviation Battalion at Fort Ord, California, from March 1979 to September 1983, and then as an aircraft maintenance sergeant with the 800th Material Management Center in West Germany from October 1983 to June 1986. MSG Allwine retired from the U.S. Army on October 1, 1986.